Through relentless focus on accountability, human capital, and charter school development, New Orleans has become a national leader in education reform. An important question to ask is: Who says so? Who is really behind the reform? Based on our experiential knowledge and qualitative research over nearly a decade, we do not believe that New Orleans school reform represents a guide for cities. Instead we assert that current reforms, including human capital and charter school development, have been immensely destructive to African American students, veteran teachers, and historically black neighborhoods in New Orleans. Ours is a warning for communities nationally. These “reforms” are not a guide for cities; they are a stark threat to the education, cultural integrity, and political-economic power of communities struggling for a semblance of justice. The Guide for Cities, we protest, did not incorporate the views of those targeted and most intimately affected by the charter school takeover and mass recruitment of inexperienced Teach for America teachers. “We have grave concerns that the stakeholders who were consulted for the Guide included only advocates of current reforms, such as state and district officials, charter school leaders . . . and philanthropists.” To be sure, the views of the Broad, Fisher, and Gates Foundations, NewSchools Venture Fund, Teach for America, and KIPP—all sectors of the entrepreneurial community that have capitalized on black children and urban public schools—were considered thoroughly. First Lesson: Marginalization of indigenous veteran teachers and leaders is viewed as innovative by education entrepreneurs, who recruit inexperienced staff to teach in charter schools at the expense of our children. Second Lesson: The development and expansion of privately managed charter schools threaten to restructure public education as a business, with indigenous traditions and place-based curricula giving way to management practices that have little connection to students and what they need to achieve and thrive. Third Lesson: Rather than universally respecting students’ right to learn, charter schools focus on cost containment in special education and may exclude or fail to adequately serve students based on such concerns. Fourth Lesson: Human capital and charter school development are reforms imposed from above without genuine community engagement regarding how to improve local public schools. Notably, there is no other city in the nation with a higher proportion of charter schools or a more aggressive campaign to recruit new teachers. Almost 80 percent of public school students in New Orleans attend charters now and most have been rated “D” or “F” by the State of Louisiana. A near-majority of the city’s teachers, recruited through Teach for America or The New Teacher Project, have been teaching for three years or less; black veteran teachers, who were unlawfully fired en masse in 2006, have been replaced by transient white recruits from outside the community (See also Forever Young). The collective bargaining agreement of United Teachers of New Orleans (AFT Local 527), a teacher union born from black teacher activism, was nullified when the state-run Recovery School District assumed control of the city’s schools. It’s hardly a model, unless one believes the strategic dispossession of black working-class communities by profit-hungry entrepreneurs is something to be replicated. Education scholars, community-based education activists, and policymakers concerned about racial and economic justice should read and consider this Warning to Communities. Authors consciously chose a peer-reviewed, open-access publication venue to enable wide distribution, vouch for quality, and avoid bias. It is imperative that communities across the nation receive more than propaganda and media spin regarding how to improve local public schools. Who is really behind NOLA education reform? Let’s unmask them. Around the same time the Guide for Cities was released, I participated in a forum sponsored by Harvard University’s Graduate School of Education entitled “New Orleans Education Reform: Pass or Fail?” Sarah Usdin, founder of New Schools for New Orleans, which issued the Guide, was the other participant. Usdin cheered the “successes” of edu-business and ignored the voice from the community. Isn’t it about time for school reform to be shaped from the bottom-up rather than the top-down? Next time New Orleans is proposed as an education model, it is probably best to ask, in the city’s well-known vernacular: Who dat say? Kristen Buras is an Assistant Professor in the Department of Educational Policy Studies at Georgia State University. She is the coauthor of Pedagogy, Policy, and the Privatized City: Stories of Dispossession and Defiancefrom New Orleans. Her forthcoming book is entitled Charter Schools, Race, and Urban Space: Where the Market Meets Grassroots Resistance. She is the cofounder and director of Urban South Grassroots Research Collective and may be reached at kburas@gsu.edu. In 2006 once family members and friends were able to return to N.O I went back. I had left the city but had lived and worked there for 32 years, 1969-2001. I’d worked as a teacher, and building and district rep. and helped in the early years, the 70s, through the rise of UTNO, the United Teacher of New Orleans. Now I was back, right after Hurricane Katrina a year later. I’d gone to visit family and friends and I attended the first “event” for the new Charter School Operations in N.O. I went with the N.O. Public school system’s video documentary and TV director; a friend I was staying with. I paid visits with other old friends. We drove around and I witnessed the destruction of my friend’s ancestral home in the Lower 9th Ward, and all the places near where he and I had lived off of Franklin Avenue; and including the Milne Boys Home where Louis Armstrong first learned to play his horn as an orphan. At the event, I saw many teachers and one person, a cohort from the Educ. Leadership program at UNO. She was now heading one the charter initiatives. Even in the beginning there were many questions- particularly by the teachers. She and I had taken Professor Luis Miron’s Critical Theory Doctoral course and participated in discussions on the corporate takeover of public education in New Orleans five years before Hurricane Katrina. Thinking of Dr. Miron, now at Loyola University, N.O., I noted the persons who were really “running the show” there at the arena. We were in the Hornet’s basketball arena next to the Super Dome. There were school Jazz bands playing and free refreshments to celebrate the new, “so called” charter school way forward. Those running the show were white guys in suits standing in the background behind the booths where parents could filter through to pick up brochures; really advertizing materials that went with a sales pitch. I told my friend DJ. “See those guys standing in the background, and just watching everything.” They look like bankers” D.J.”They are really running this show and you need to get their pictures,” I said. I have them! Wow! 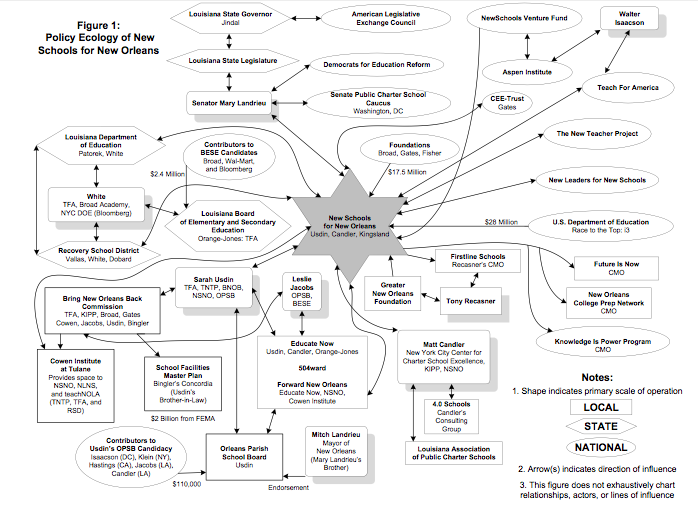 This is the best graphic I’ve seen to depict the web of influence in N.O. schools, not moving to the Baton Rouge area. I know the disclaimer says the list is not exhaustive, but I wanted to point out, again, the connection of the La. Assoc. of Public Charter Schools (LAPCS) to the State Board of Education (BESE) – the two leaders of those groups are brother and sister. In response to an ethics request, the state Ethics Board said that LAPCS leader (sister to the BESE president) could not testify on behalf of her organization at BESE meetings; however, that does not stop her influence in how her brother votes on key charter issues. In fact, she sends him hand-written notes during the discussion before these votes with talking points used to persuade other board members. NOt that many of them need persuading, as this graphic adequately points out that 8/11 members were bought and paid for by ALEC members and Bloomberg. Also, the most recent 2 BESE Exec. Directors are TFA alum – one of whom secured those campaign donations for the chosen candidates. I’ve been slowly working on my own post about the reform network based on Kristen’s Excellent work which I just got ahold of this weekend. In the meantime I strongly encourage you to read this great synopsis of her analysis and findings.